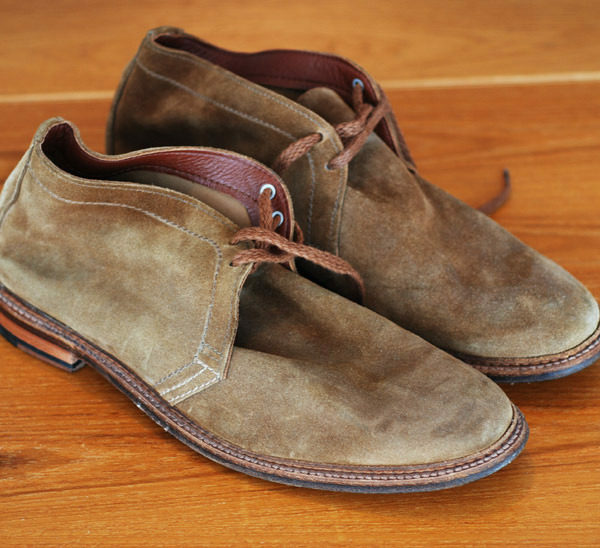 Nathan writes: I recently bought a pair of Alden unlined chukkas as a graduation present for myself. The process wasn’t without a lot of anxiety, however, over the ridiculousness of spending this much money on shoes. Now I’m afraid of wearing these boots because I don’t want to ruin them. Do you have any advice on proper shoe care, so I can actually enjoy my purchase? Shoes are meant to be worn, of course, and the good news is that when you buy something well-made, they’ll only look better with age. That goes for everything from dress shoes to work boots, suede to shell cordovan. Like a pair of raw jeans, good leather looks better once it has some character beaten into it. Practice Basic Shoe Care: Rotate your shoes so you’re not wearing the same pair two days in a row. The sweat from your feet can break down the leather, so give your shoes a day to dry before wearing them again. Also, insert cedar shoe trees when you’re not wearing your shoes. Good ones can be had at Sierra Trading Post for about $12/ pair (just use their DealFlyer coupons). Use a Waterproofer: Protect your shoes from dirty roadside splashes and spilled drinks by spraying the uppers down with a silicone-free waterproofer, such as the ones sold by Allen Edmonds and Tarrago. Check out this video from Leffot, where they pour a full cup of coffee on ~$500 suede shoes after spraying them with a protectant. Seriously, this stuff is like magic. Clean Them Up: If your shoes start to get dirty, brush them down with a suede brush and eraser. You can also give them a more serious cleaning by washing them with a 50/ 50 mixture of water and Saphir’s Omni Nettoyanat Shampoo, scrubbing them with a suede brush as you go, and then letting them dry naturally outside in the sun. For more serious stains, put some kind of absorbent powder on the area, such as baking soda, talcum powder, or Terre de Sommieres. Those three steps should take care of most jobs. Other than that, just enjoy your shoes. 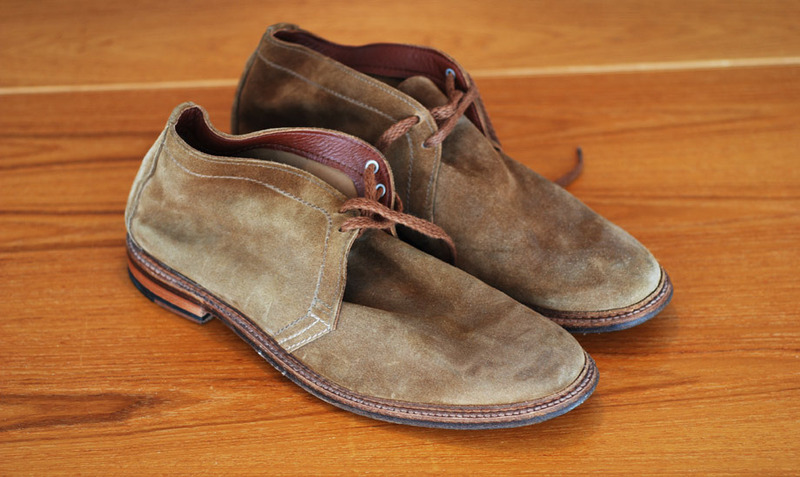 Suede will naturally get a bit dirty, and even bald in certain places over time, but that’s all part of the charm. Once the soles grind down, send them to Alden or B. Nelson for a resoling. With good care, your chukkas should last you ten or fifteen years (and look even better than the day you first got them).